Trump's Executive Order Could Dismantle Parts Of ACA Before Replacement Is Ready : Shots - Health News As promised, Trump got to work on Day 1, taking the first steps to fulfill his pledge to gut Obama's health care law. The order's reach, however, depends upon which provisions he decides to target. It's so broad it could allow many of the law's provisions, including many of taxes it imposes on insurers and the requirement that individuals buy insurance, to die from lack of enforcement. The order is an important political act for Trump, who pledged throughout his campaign that he would act quickly to roll back the health care law. Its reach, however, depends upon exactly which provisions he decides to target. The order comes as Trump's pick to lead the Department of Health and Human Services, Rep. Tom Price, R-Ga., is awaiting his confirmation hearing and vote, which could come within days or weeks. It's unclear how much of this order could be carried out before Price, if he's confirmed, is installed at HHS. Trump's order also pushes one of his favorite health care ideas — to allow insurance companies to sell policies across state lines — by encouraging "the development of a free and open market in interstate commerce for the offering of healthcare services and health insurance, with the goal of achieving and preserving maximum options for patients and consumers." It lands just as members of Congress are working to repeal and replace the Affordable Care Act. Trump and Republican lawmakers have promised that any repeal would be followed immediately by a replacement for the law and they've said that anyone who has insurance through the ACA will not lose it in the transition. "While President Trump may have promised a smooth transition, the Executive Order does the opposite, threatening disruption for health providers and patients," said Leslie Dach, director of the Protect our Care Coalition, a group of organizations trying to save the Affordable Care Act. Health policy analysts have warned that repealing the unpopular parts of the law such as the taxes or individual mandate could lead to the collapse of the individual health insurance market. 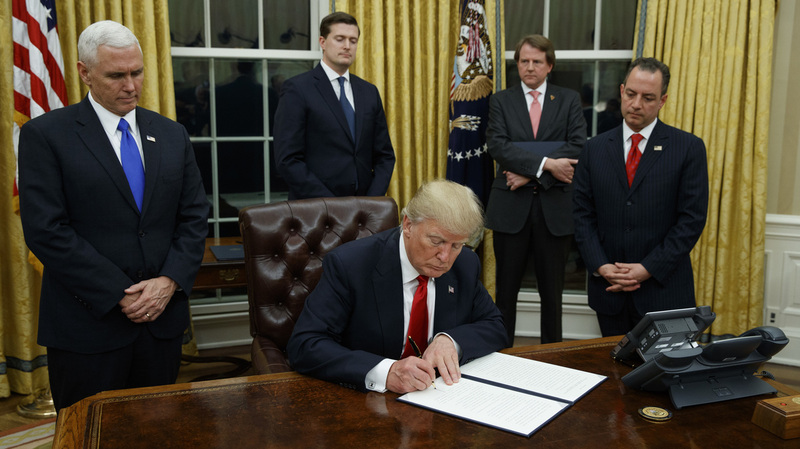 This executive order could allow those provisions to be rolled back before a replacement bill is ready. Republicans in Congress have laid out a number of broad road maps for a new health care law but have yet to reveal a specific bill that would show how many people will get insurance coverage or how much it might cost.